After an incredible fight, my aunt lost her battle with cancer last night. It's still surreal to think about how quickly everything happened in the last few weeks. At the end of January she was with us all at my folks place for my mom's birthday, and suddenly only a few weeks later she was in hospice and everyone started talking about and preparing for the end. For lack of better words, it's just sad, upsetting, and unfair. My cousin Leslie has written about her mom in great detail, sharing pictures and stories throughout this entire experience. It's been inspiring, and a great source of comfort to see how well my aunt was being looked after and how much love surrounded her. I only saw her briefly a couple times while she was in hospice, and the changes with each visit were dramatic. My parents visited her on an almost daily basis, and witnessing their emotions throughout all of this was just as eye-opening and heartbreaking. It's overwhelming to be swept up in a situation like this, knowing that you're heading for an inevitable conclusion. I'm only happy she's at peace now. In lighter times, the family gathered at my aunt and uncle's place and we ended up playing with all these bubbles in the backyard. This was a short video I shot in 2011. One of my favorite childhood pictures of my cousins, with me being held by my aunt Bonny ca. 1984. 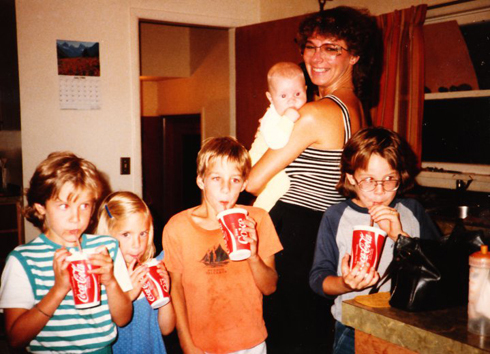 I joked that this was the moment my addiction to slurpees started. Christmas was always a great time, and pictionary became our go-to game. Here were some of the highlights I shot in 2010 (what ended up being our last major Christmas gathering) and you can see my aunt really getting into the game around the 0:50 mark. My aunt's influence is strongly rooted in my memories as a child, so it felt natural to dwell on those thoughts. You can't help but feel a bit selfish sometimes too because you're wrapped up in your own loss. In reality, you're left struggling with the urge to do something - to do anything - knowing that you're essentially powerless. To be a casual witness in the rapid decline of someones health is rough. The death of my Aunt Bonny has been an emotional roller coaster, not unlike the loss of my grandma or my friend Dave in the last two years. All of these instances have been dramatically different, blindsiding me, making me vulnerable, and teaching me a bit more about life and death in the process. Perhaps the most troubling and strangely positive thing in this circumstance was that everyone saw the end coming. We were fortunate to say our goodbyes directly and make our peace while there was still time to do so. It's a bizarre luxury in a heavy situation. On my first visit to my aunt in the hospital I gave her this letter, and I think it seems appropriate to share it here now. After everything, I feel that this was my real goodbye. For the full effect, play Noah & the Whale's song below - it was the one I was listening to when I wrote the letter. I wanted to write you this letter because I felt it would probably be easier for me to say all of the things I really wanted to. As someone who has witnessed everything you've been through from the sidelines, I can't begin to understand just how difficult and emotional your journey has been. However, your strength, bravery, and positivity through all of this has been nothing short of remarkable. That said, I wanted you to know what a defining role you've played in my life, and the influence you've had on me since I was a child. In no small part, you've played a role in making me the man I am today. 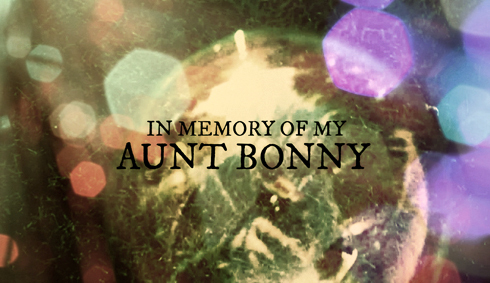 Everyone should be so lucky to have an Auntie Bonny in their life. Growing up I'm hard pressed to think of a family event that you weren't there for. From birthday parties, camping trips, and Christmas dinners, to bocce ball, backyard fires, and summer visits on my mom and dad's deck, you were there. That alone made a lasting impression on me as a kid. To me you were always a really cool aunt who happily spoke her mind. I remember debating you as a little kid as to whether or not cars went to heaven when they died. You didn't think they did, but I was adamant that you were wrong and I remember us having an entertaining back and forth on the topic. I love that memory, and it still makes me laugh now. You have always seemed fearless in my eyes, and as I've grown up it's only made my respect for you grow stronger. When Alison and I would come and stay at your place, it was always a blast. Running around in our underwear, jumping on the inner tube in the backyard, spinning in that giant computer chair until we were dizzy, the overflowing bubble baths, you spiking my hair in the bathroom mirror, the trips in the van to local landmarks, you putting extra noodles in my chicken noodle soup, and of course, the famous jello jigglers you'd make for us. You went out of your way to make us feel special, cared for, and loved, and it's why Alison and I still remember those visits so well. If I never said it before, thank you for doing all of that and for making us feel fearless too. Thank you for supporting me and nurturing my passions, even before I really knew what they'd end up being. Whether I was just playing with a video camera, debuting a new video with the family or talking about film school, I loved that you took an interest in what I was doing. Your individuality and energy has always been a positive influence, and as a familial role model the example you set never went unnoticed. You also captured some of my first film roles on camera because of that giant VHS video camera, so there's really no telling what a big impact all of that made on me, haha. Most of all, I just wanted you to know how thankful I've been for everything you've done, and for giving so much of yourself to our family. You're an amazing lady, and an inspiration to me. Whatever the future holds, know simply that my life has been better for having you in it - and for that, I can't thank you enough. This is beautiful Luke. Thank you so much for sharing your letter to her and those videos are wonderful. I don't think I saw the Christmas video before! It perfectly captures the spirit of those times. Wish I had been there for that one, but there were dozens just like it that I remember. Much Love to you.